A brief history about All Saints' Church and King Charles II. You can also read about the Consistory Court. Past vicars, John Bales and a short piece about the Northamptonshire Pastoral poet, John Clare. An explanation of our connection to early settlers of Virginia and New England. A brief history about the church bells and their current Company of Bell Ringers. The history of Thomas Dawes and his dial clock. Information about the Walker & Sons Ltd. Gallery Organ. Information about the Hill & Son and Norman & Beard Chancel Organ. Information about the J. W. Walker & Sons Ltd. Chapel Organ. The Chancel organ and its installation was a gift from Mr and Mrs Davidge and we are indebted to their generousity for such a fine instrument. 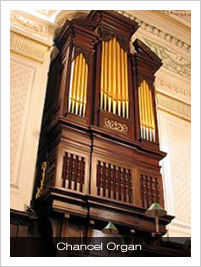 The installation of this instrument, formerly located in St Andrew's Church Bournemouth, was supervised by Kenneth Tickell & Co, who also added new stops (marked with an asterisk in the technical list below). It is electrically coupled to the Great and Pedal divisions of the Walker Gallery Organ, with six duplicating pistons. The Church also has a one manual and pedal Organ by Walker in the Memorial Chapel and a Bechstein Grand, formerly owned by Clifford Curzon. The Chancel Organ is driven by electric action and has a total of 1,824 pipes. The organ's technical details are listed below.